I finished this one up a few nights ago… when I finished the Russian KV-1 with bolt on applique armor. 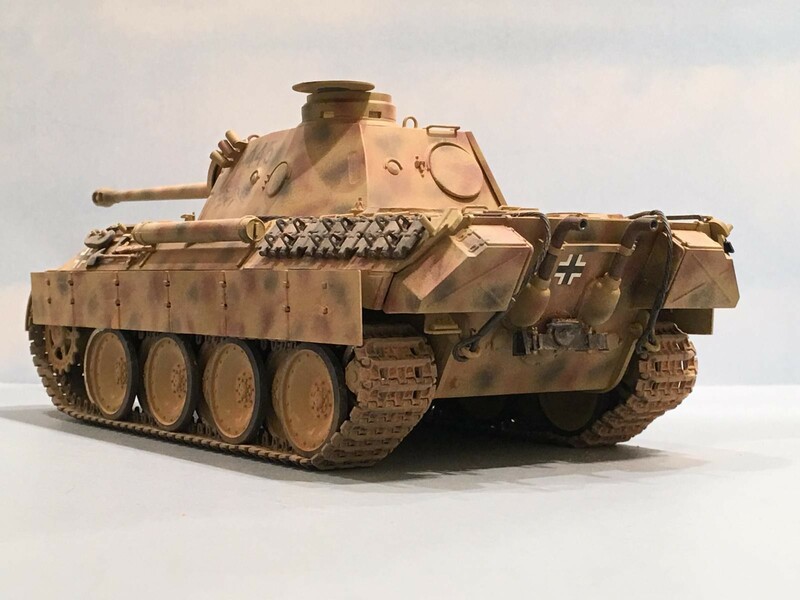 This Tamiya German “Panther D” tank has a build thread following this link to the “Year of the Cat” Group Build. 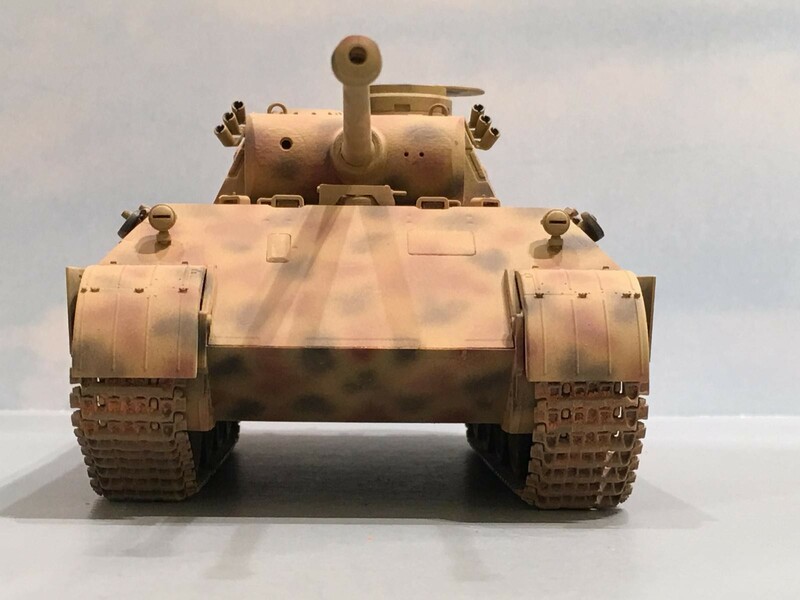 Since the “Year of the Cat” will not be officially over until sometime after mid February, 2018, I’m encouraging members who are participating to go ahead and post their builds as they complete them. This will allow their work to be admired by all that much sooner, and will hopefully generate even more builds, (since it’s such a long way out before mid February arrives). 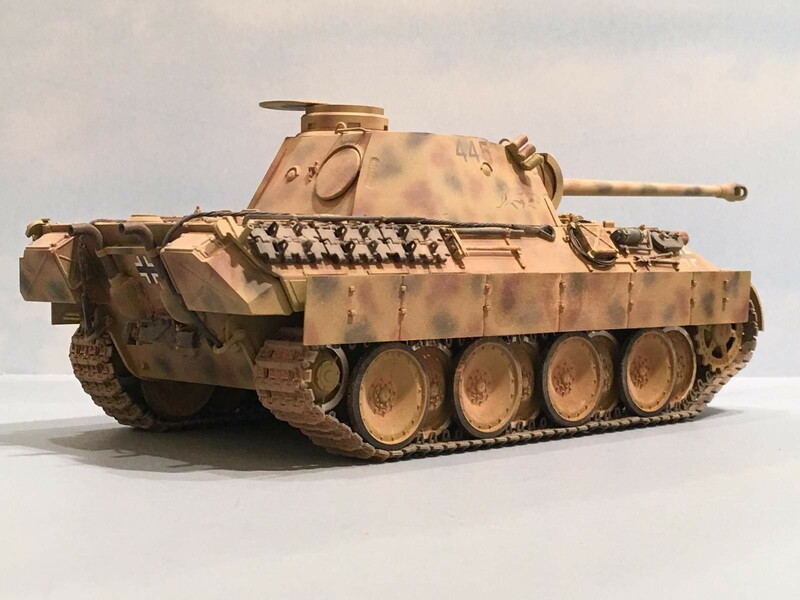 Once the “Year of the Cat” GB has ended, I will post a compilation of the builds in similar fashion to how we did with the review of the “Midway Group Build” not too long ago. So far we have 40 builds happening in the GB, with several that have already been completed. I am very pleased with the response we have received. There is still room for more to join in. If you haven’t done so already, please check it out… Thanks ! This one was a very enjoyable build. The hardest part for me, was deciding on which markings and camouflage patterns to use ! 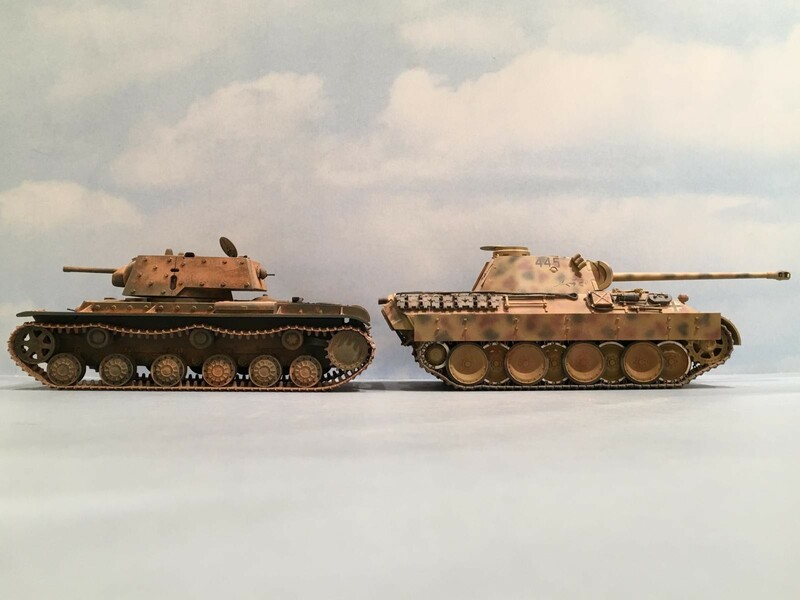 Tamiya has provided in the kit, a very nice color print instructional sheet that shows the colors and markings for 3 different early Panther “D” model tanks. 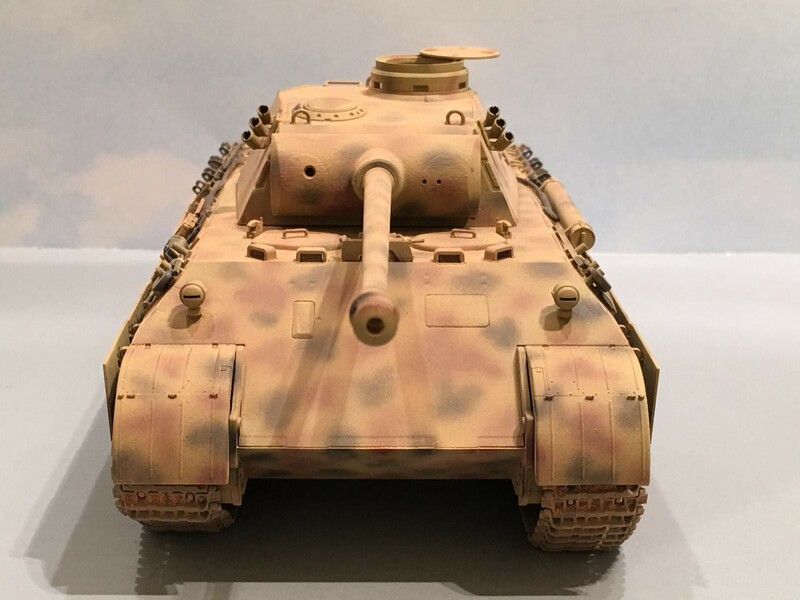 Many don’t know this, but the “D” model Panther was actually the first version. 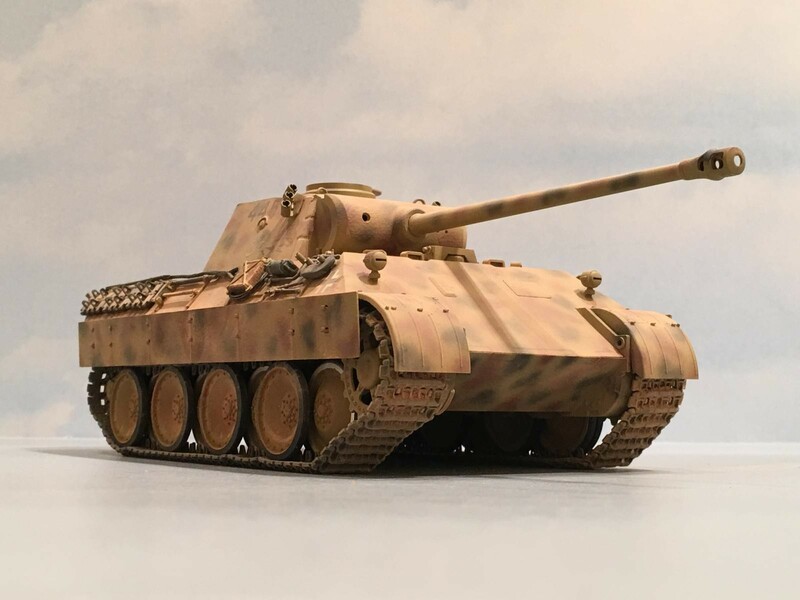 Later on in the War, it was followed by an “A” model, and then finally towards the end of the War, a “G” model Panther was produced. Each one was an improvement upon the last variant. 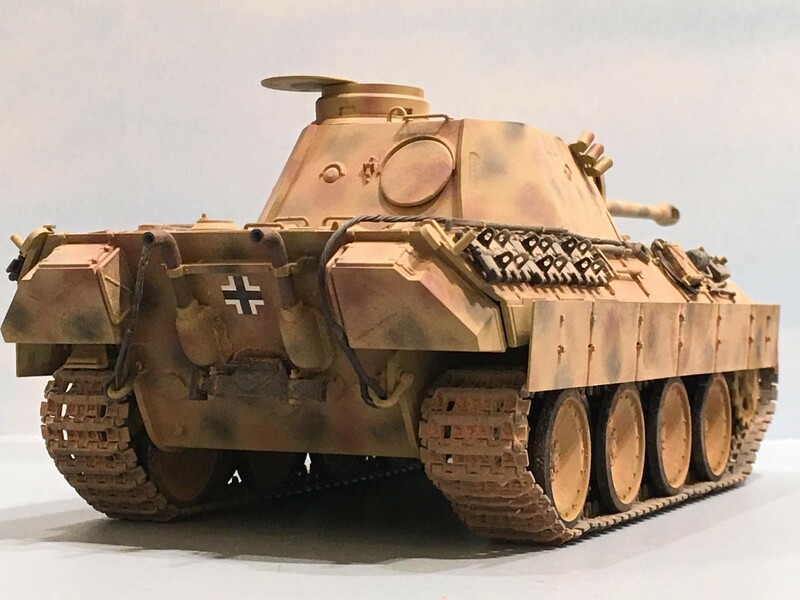 The fit was superb, and is your typical Tamiya kit that has some nice “extra” features, that are available for purchase separately from the actual kit. 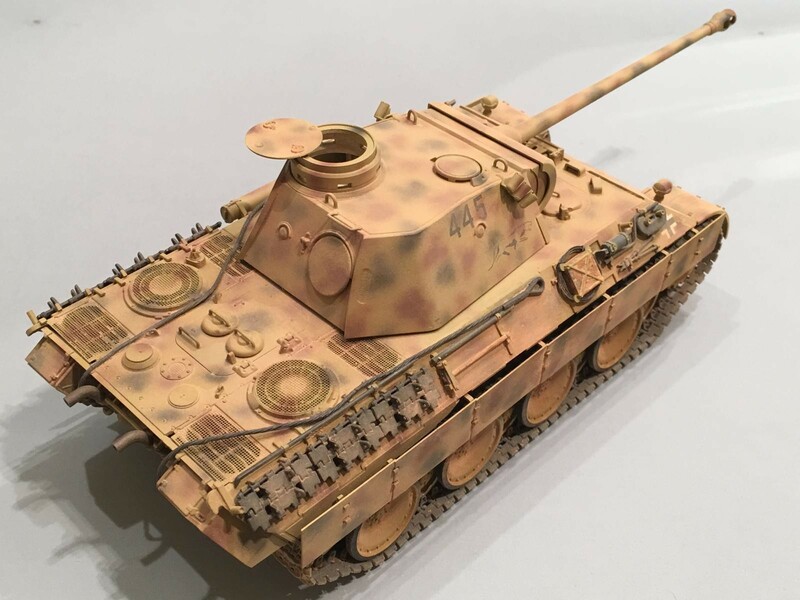 For starters, I used the Tamiya individual track links for an early Panther. These are a nice simple arrangement that are actually workable once completed. Each individual track link has you glue a separate center guide part, making each link two parts. 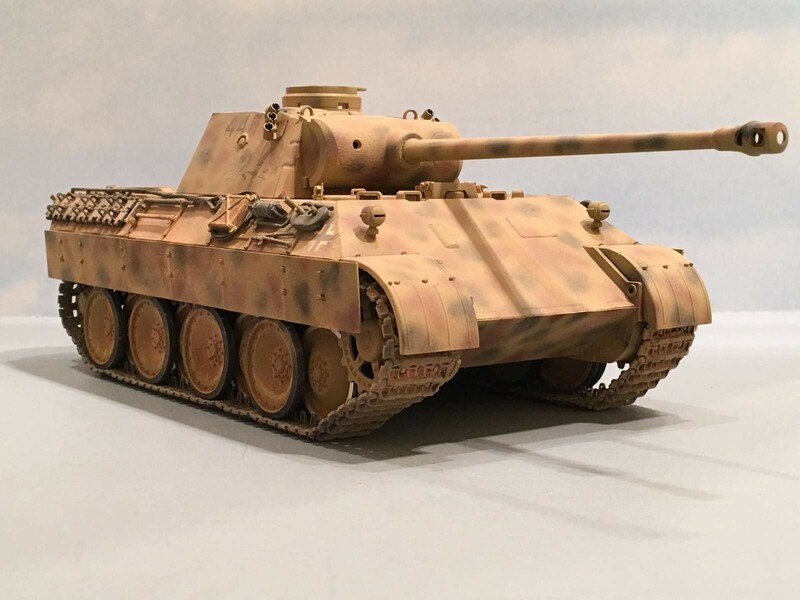 The center guide part has two center guides cast into it, and the guides are molded hollow, which capture the look of an early Panther track link rather well. The links then simply snap together, and remain highly flexible. They are molded in a somewhat dark gray. Next I used the Tamiya “Metal” gun barrel upgrade, which also gives you a few more detail parts for the main gun, and a separate set of instructions that supersede the kit instructions. 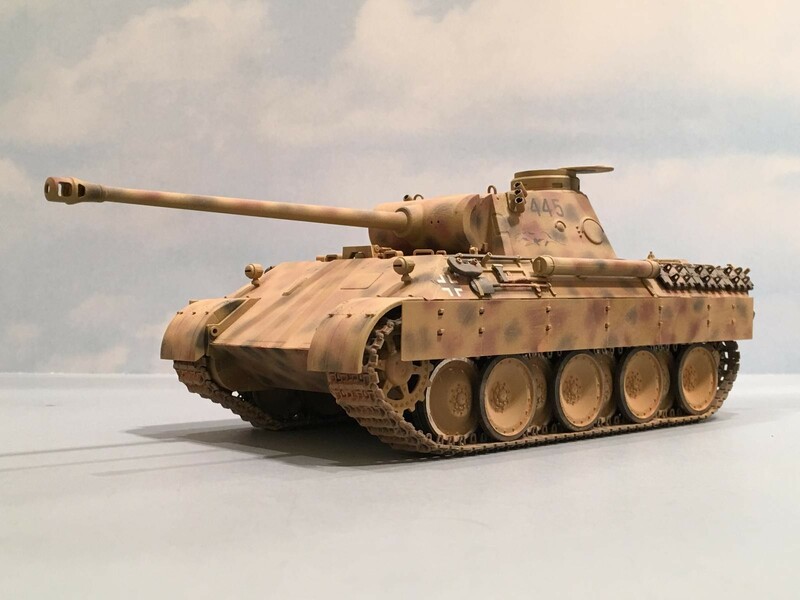 The end result is a fabulous looking high velocity KwK 42 / L70 which is a 75 MM main gun. The last upgrade also involved a separate Tamiya available option. It was the photo etch set that provides some realistic screens for the fan towers and upper grills on the back deck. This is a very worthwhile addition and provides a lot of bang for your buck. I opted to try something new and used “Bare Metal Foil” on the areas of the road wheels where the track center guides would have rubbed up against the wheels. This is a very common sight on all Panthers. They all had very shiny steel wear areas on the road wheels after a few minutes of normal driving. I built the provided crew members, and they look great. But my figure painting skills are not the best… Maybe later I will add them if they turn out OK. 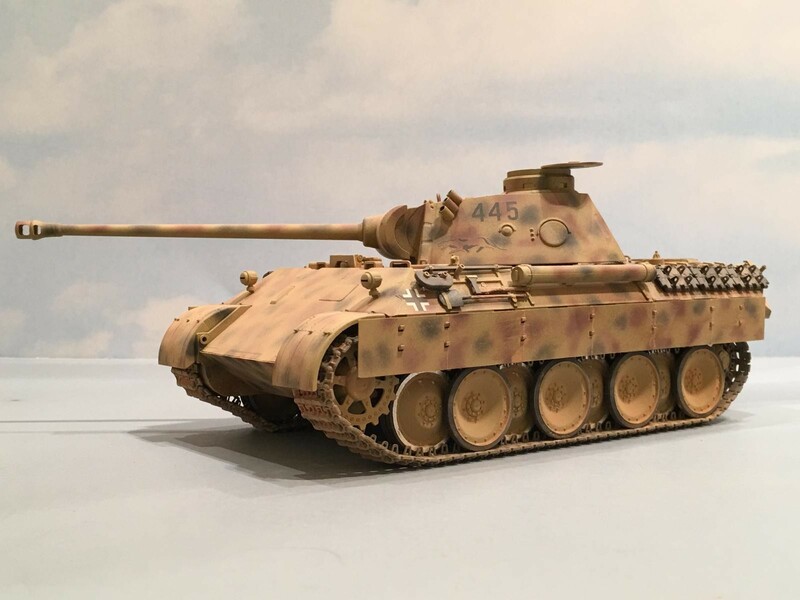 I used the kit decals, which are for a tank that is with the “Grossdeutschland GD” Panzer Regiment, tank number 445, which was near Kursk in August of 1943. Kursk was the largest tank battle of WW2, and was only eclipsed many years later during the first Gulf War in Iraq. 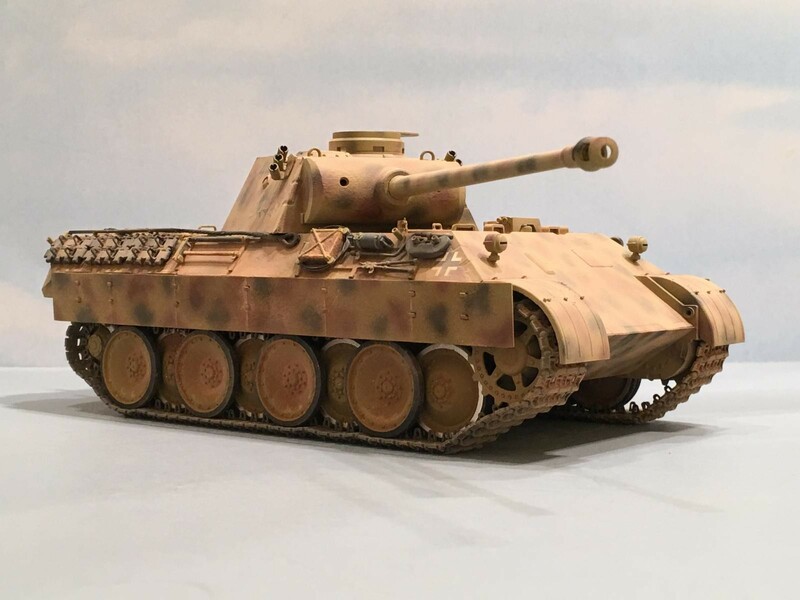 Kursk was also the first time that the Panther tank was used in combat. 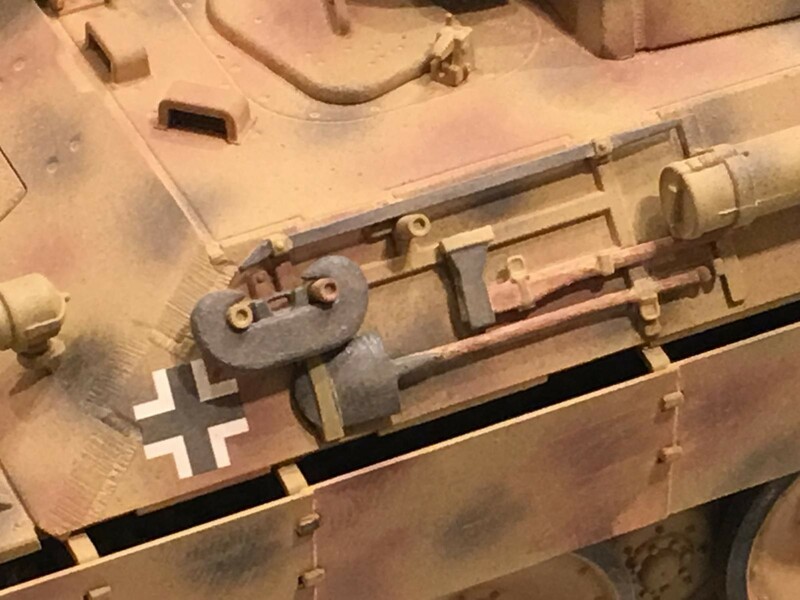 One last thing I did that deviated from the kit plans, was I substituted fine copper wire in place of the cloth string that was provided for the tow cables. 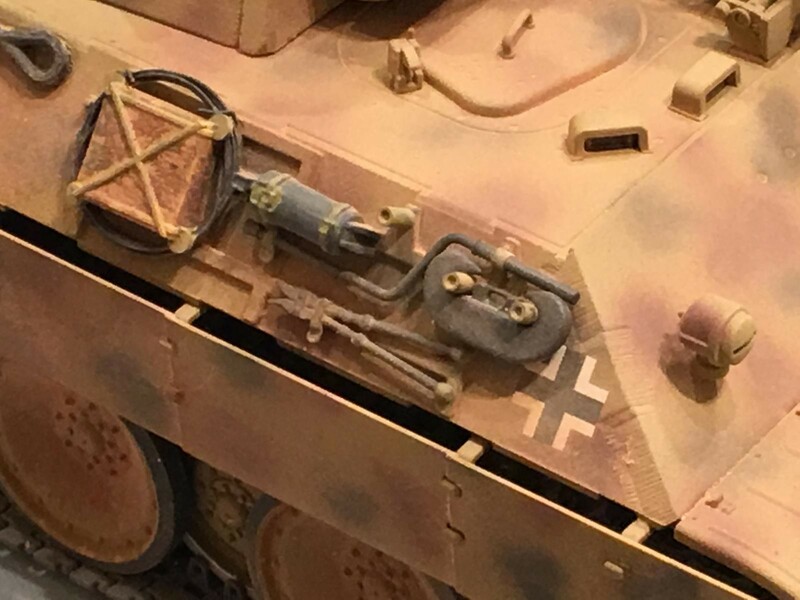 I also connected the tow cables to the tow clevises on the rear of the tank, as they were sometimes done just prior to entering battle. 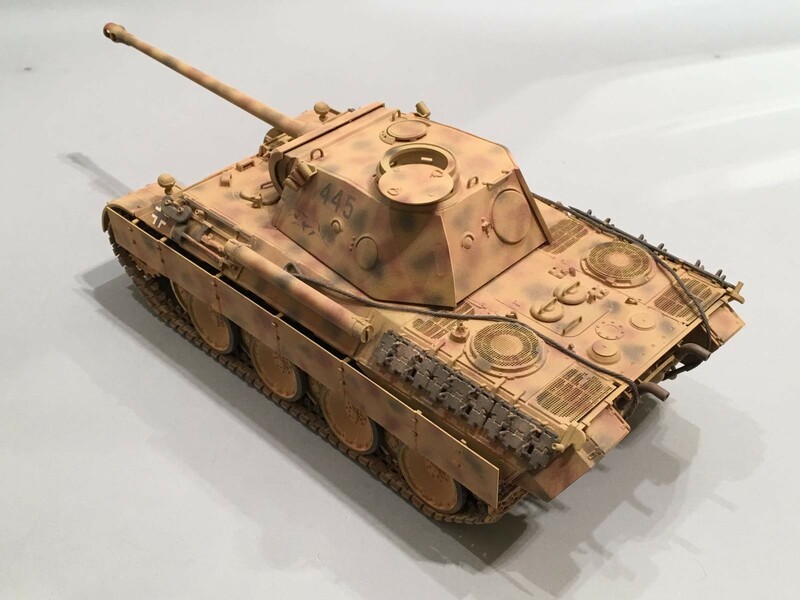 The Panther was sprayed using Tamiya Acrylics, and the dust was a simple mix of various colored chalks. I used Testors “Dull Coat” to secure the chalk powder in place. 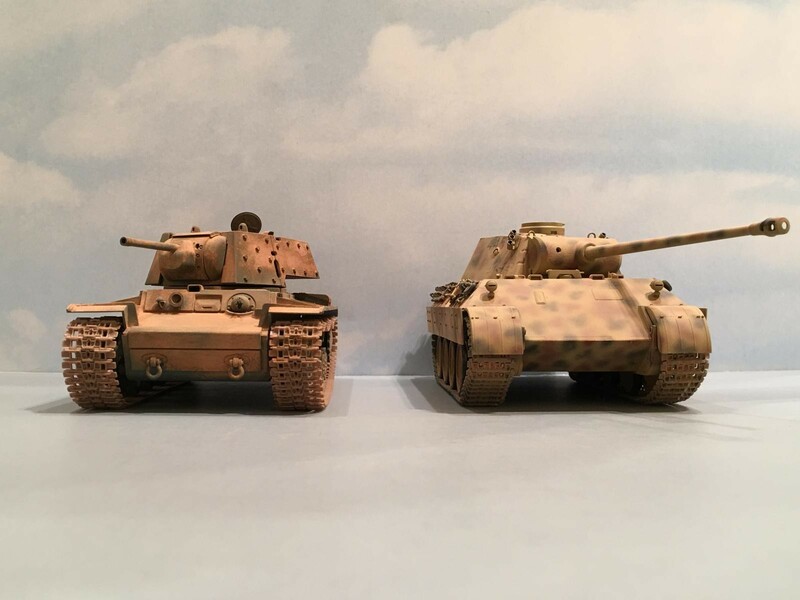 I added the last few pictures that show how the Panther compared in size to the Russian KV-1, which was considered a “Heavy” tank at the time, and eventually morphed into the “JS” or “IS” “Stalin” series of tanks. 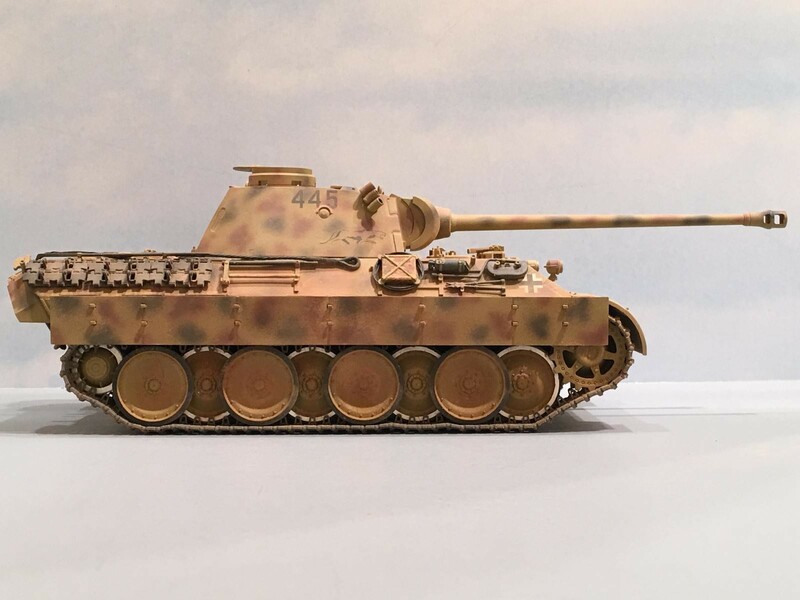 From what research I have done, Panthers from the 51st and 52nd Panzer Abteilung were attached to the Gross Deutschland Division. 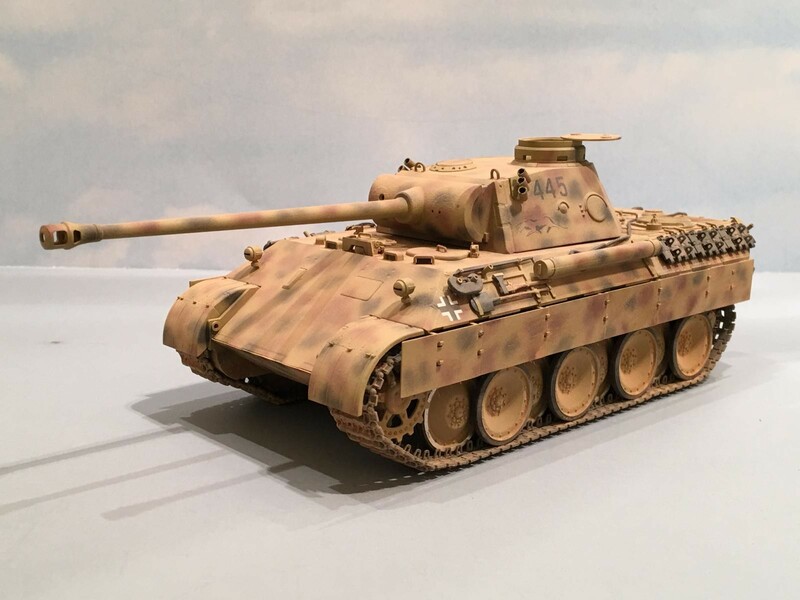 From the first combat deployment, many of the Panthers broke down due to various mechanical problems. Some broke down just as they left the rail cars, and didn’t make it but only a few hundred feet before they broke down. These problems were well documented and ranged from things as simple as having recycled hydraulic oil in the turret’s power system, (which caused bubbles in the oil and then the turret wouldn’t traverse or the main gun wouldn’t elevate / depress as quickly as it should) to engine fires and transmission failures that sometimes caused a total loss of the vehicle. 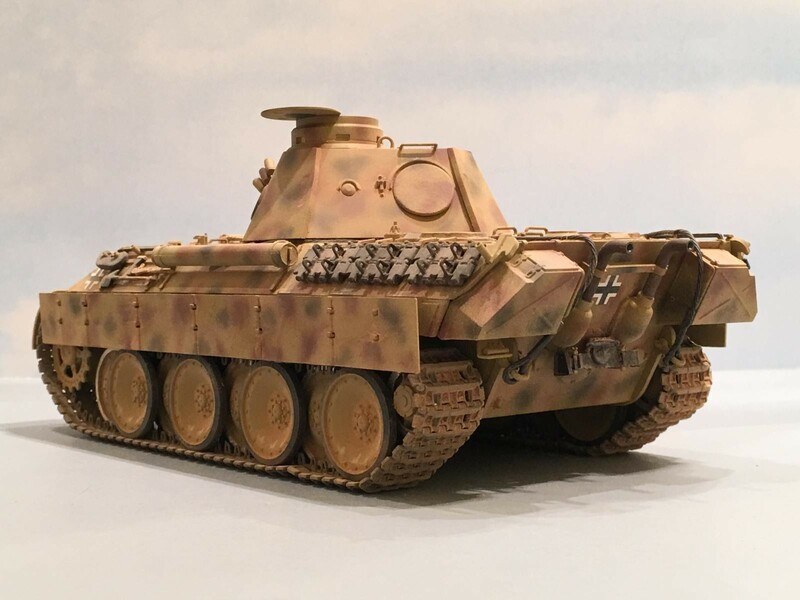 Then there was the time when a German Commander used his brand new Panthers to clear a Russian mine field ! This also caused considerable losses, but most of these vehicles were eventually repaired and placed back in service, after they were recovered by maintenance crews. 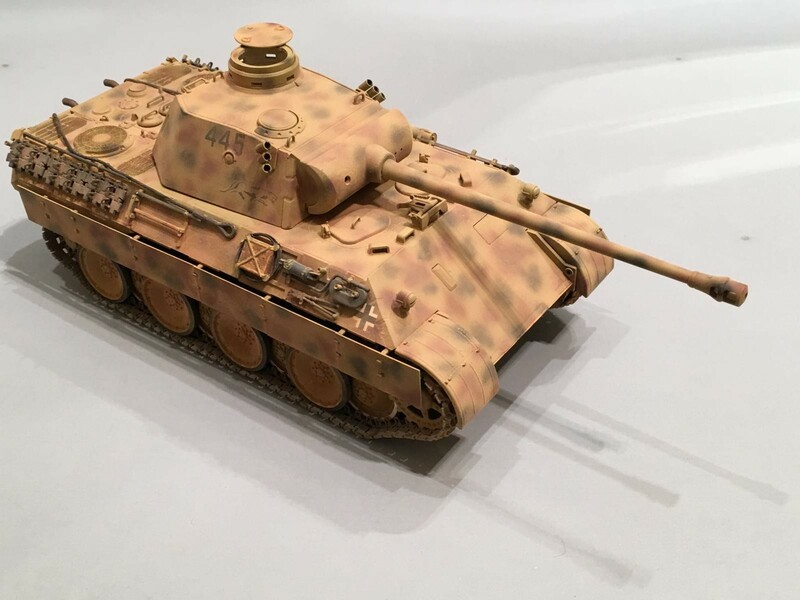 As normal with anything that is new in service, the Panther had what would be called “teething troubles”. 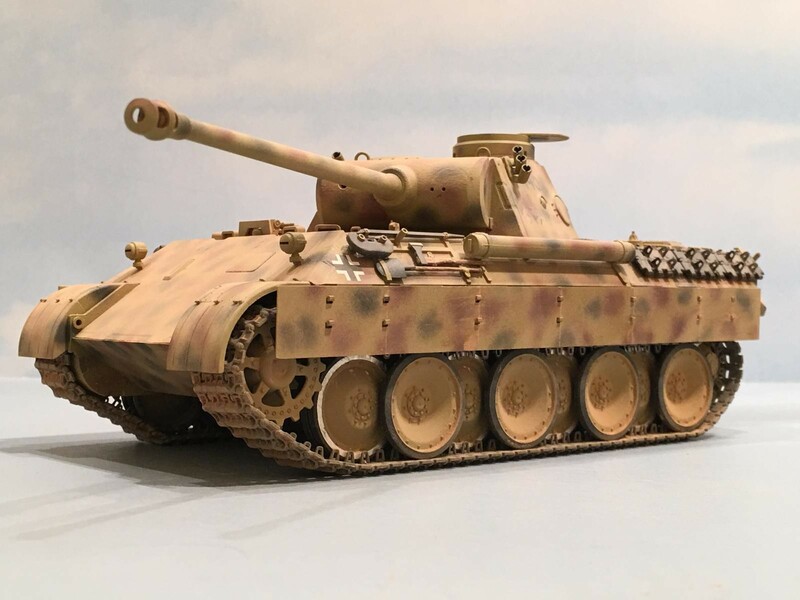 Once these problems were corrected, the Panther went on to become one of the best tanks to see service in WW2 (in my opinion…). 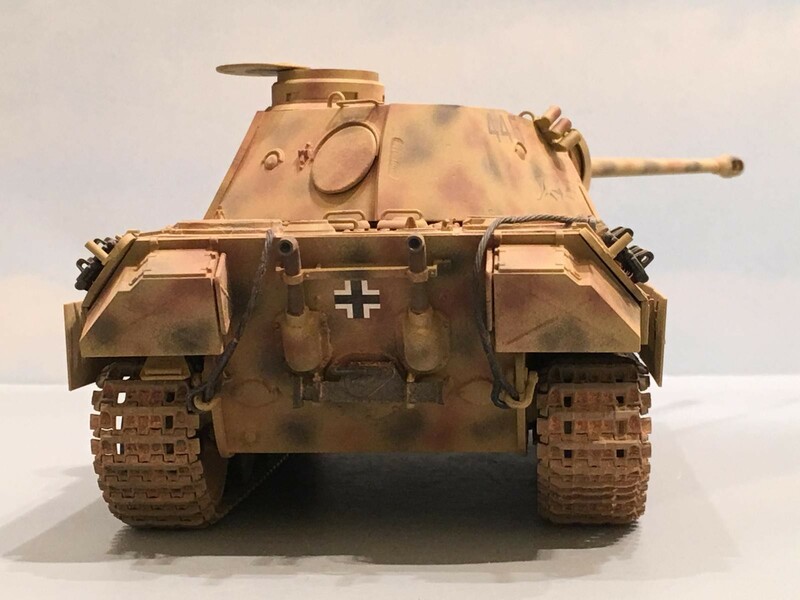 Since I wanted to represent a brand new (or newly repaired) Panther, I didn’t simulate any damage and kept all of the side skirts in place. The early Panthers also used a two piece front fender. Most of the time the lower section was either removed when it became damaged, and not replaced that often. My model has both parts of the front fenders intact and not damaged. I like it, Louis – even without any battle damage (I mean…they had to be “fresh” at some point, right?). As usual, a great build, narrative and pics. Who could ask for more? 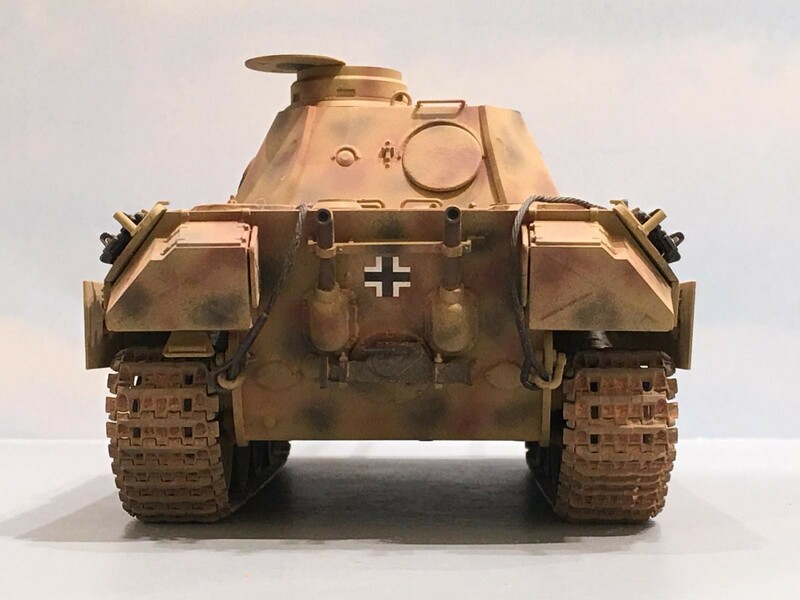 I wanted this one to look just like it had been repaired and “attached” to the Grossdeutschland unit. It has a light coating of “dust” on it, since it was dusty and dry at the Kursk battle. Thanks for the compliments buddy………………. Thanks again for organising the Year of the Cat group build, Louis. 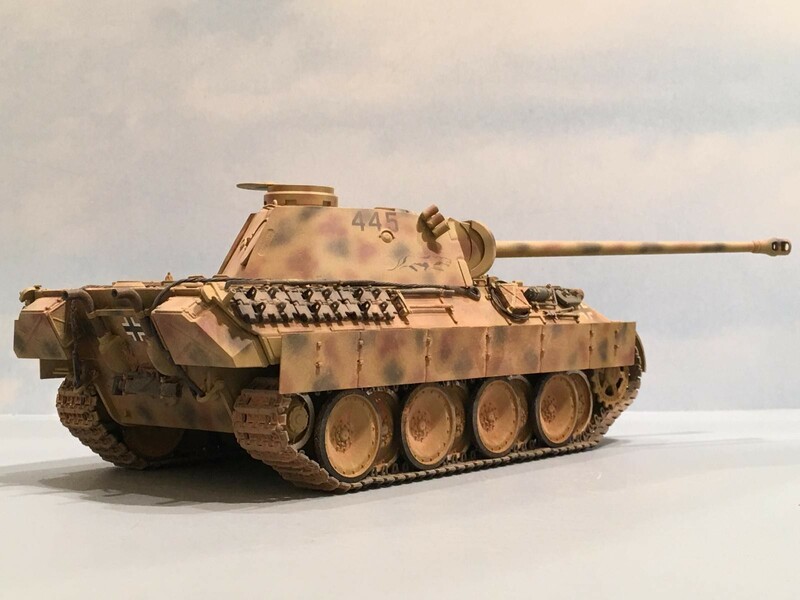 I didn’t realise we could post our completed models before the February deadline…… anyway your Panther D is awesome, I often use the Tamiya “detail up” kits when I build their motorcycles, and although it increases the cost of the kit they are definitely worth it, as your tank proves, and it makes a nice change to see an undamaged unweathered tank, go on, add those figures, I’m sure they’re just fine. You are welcome George. I’m glad that we have had such a great turn out with people who have added their builds. Yes it’s perfectly OK to post up your completed builds after they are completed. I will make another posting after everything is done showing the finished results. This way the builder doesn’t have to wait such a long time to post their articles and can move along to another project, possibly even starting another “Year of the Cat” build. Yes I wanted to keep the weathering to a minimum on this one. 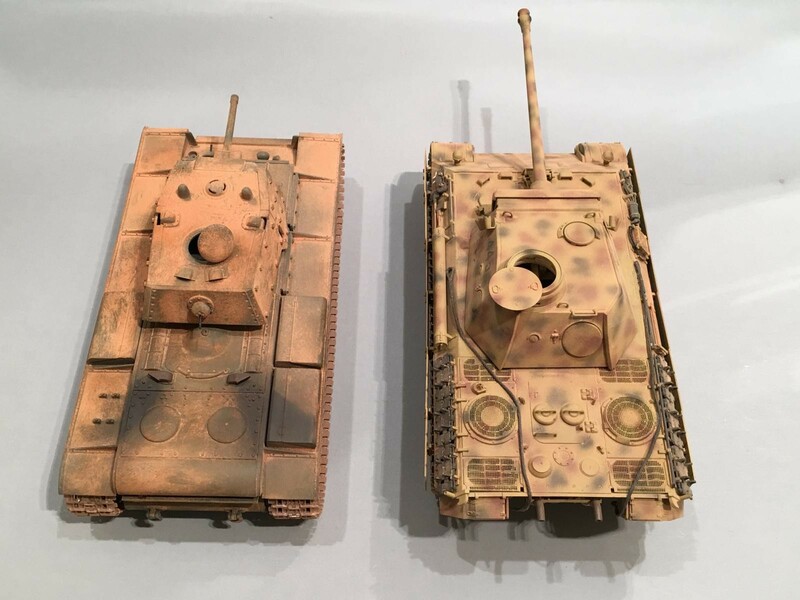 So I applied a light coating of chalk “dust” over the whole model, since it was dusty and dry during the Kursk battle. 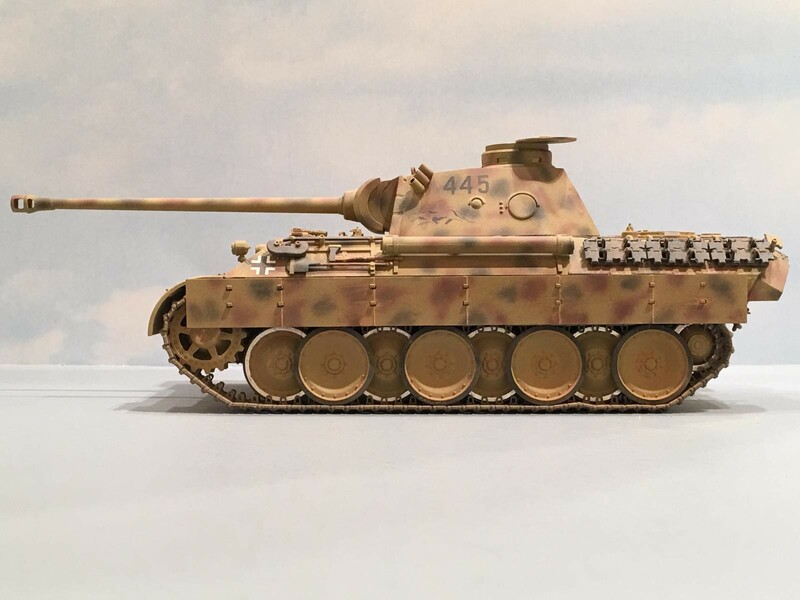 I really like building Tamiya kits. The little “extras” they offer are like icing on a cake. I still have yet to paint the crew figures. When I do, I may add a few photos to this posting. Thanks for the kind words my friend. I’m glad to see that you liked the article as well. Louis, good stuff here. 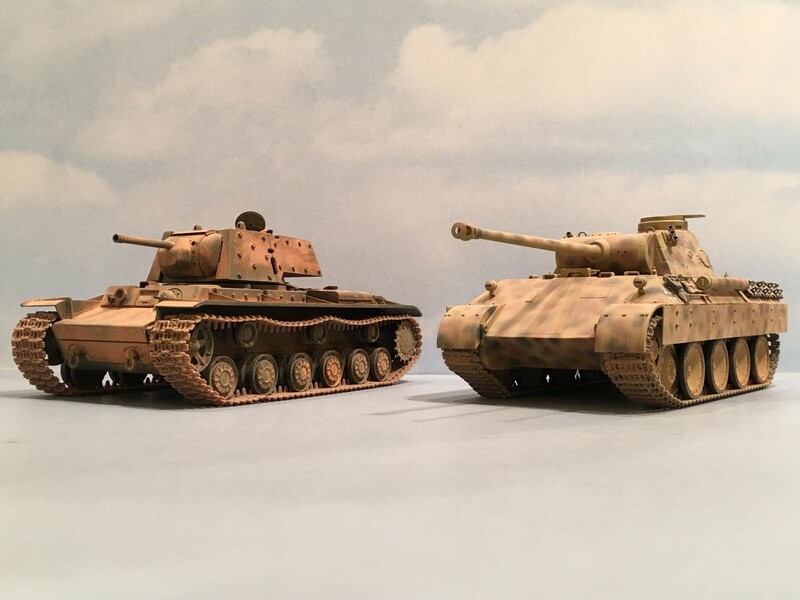 I like that gave us comparison pictures with the KV-1. Well done. I’ll be beginning my cat entry soon ! Thanks Terry. 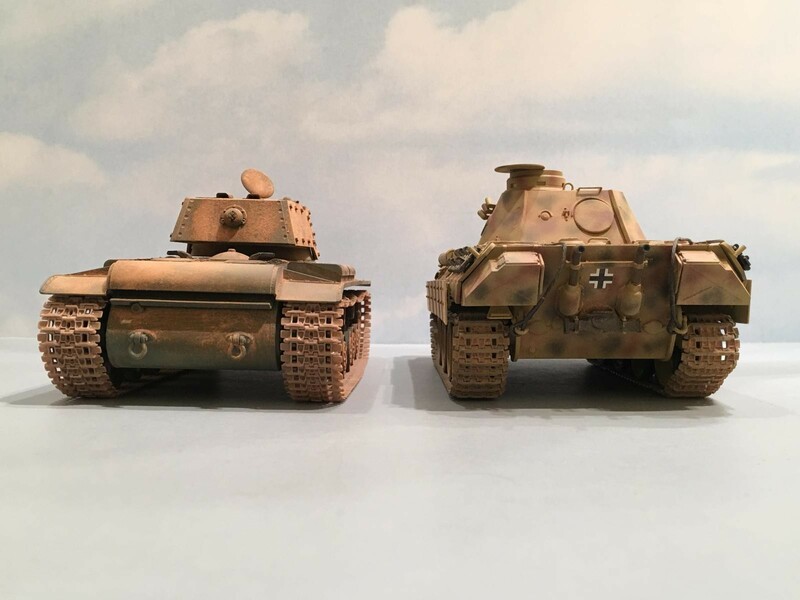 The KV comparison photos show how big these brutes were. We will be looking forward to your GB entry. Good looking target Louis! It looks like it’s spoiling for a fight. Thanks Greg !!!! It does look pretty menacing………………… Thanks buddy. 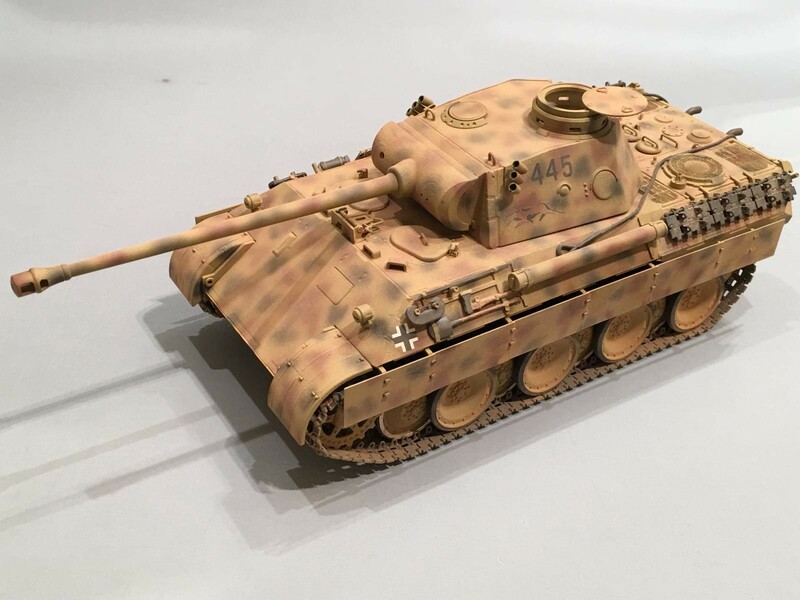 Great work again Louis – as Terry says the comparison with the KV-1 is great to see. Thanks for “liking” the article David. I’m happy to see that you enjoyed this one……………….. The comparison was a spur of the moment idea. It turned out pretty good I think. Wonderful job Louis! It sure makes a change to see a “clean” version like it’s fresh from the factory. Got to catch up with things to read on iModeller as I had “normal life” standing in the way as usual…. I have been too busy with other projects out in the shop………. as you say, “life” has been getting in the way too, so I haven’t had much time lately for building anything. I didn’t want to weather or dirty this one up too much. Instead I wanted it to look like it had just been repaired at a maintenance depot or field unit and was ready to go back at it again. This actually happened to the majority of the Panthers during the Battle of Kursk. From what I have gathered online, Kursk was hot, dusty and very dry. 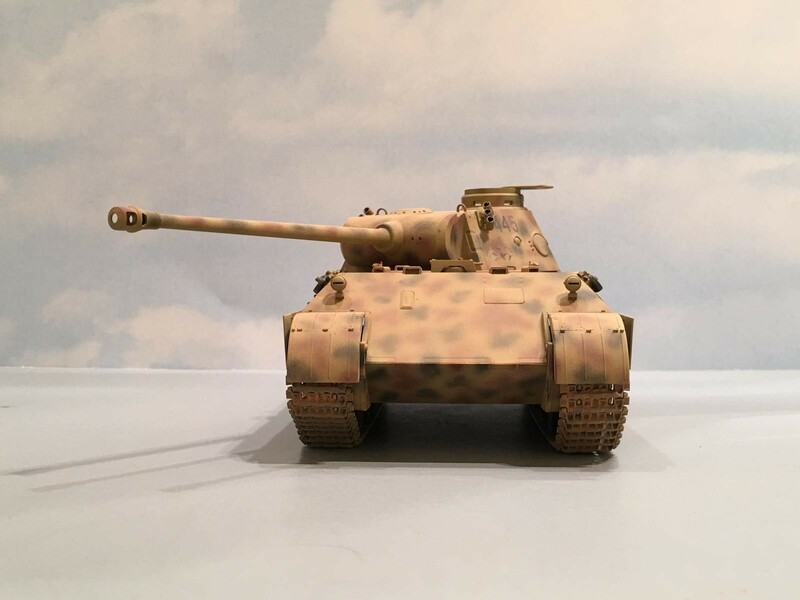 So I simply used a light coating of chalk dust to replicate this effect on the tank. Thanks for “Liking” the article too my friend. Congratulations Louis, this has turned out marvellously well! The dust is a perfect finishing touch! 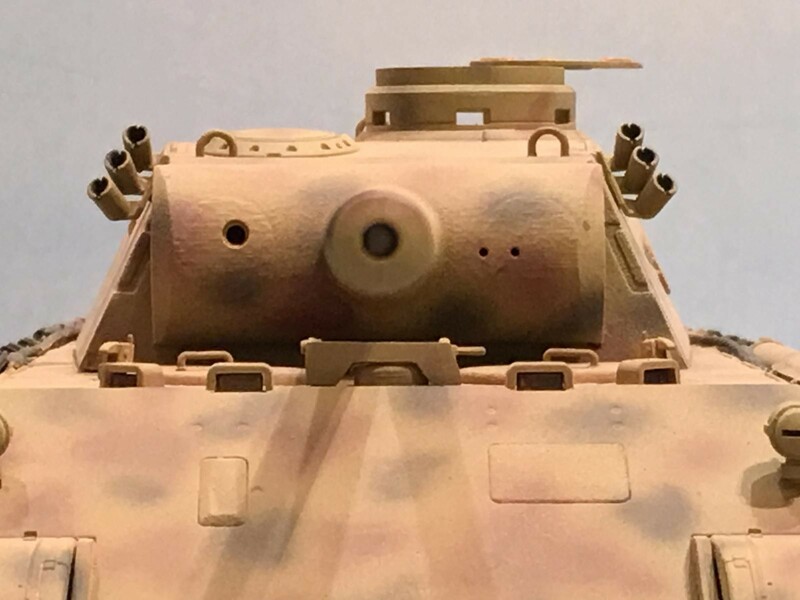 It looks great on both tanks. Great history lesson too – honestly I can’t imagine too many were impressed by that sort of mine clearing! It’s a pain when life does its thing! I picked up a sanding stick for the first time in a month today! Inspired by catching up with the YOTC group! I’m glad that you enjoyed the article, and I sincerely appreciate the compliments. It’s good to hear that you were able to do some building today………….. hopefully this trend can continue for all of us. On occasion though, life does get in the way of our hobbies. But we have to take the good with the bad………. take care my friend. 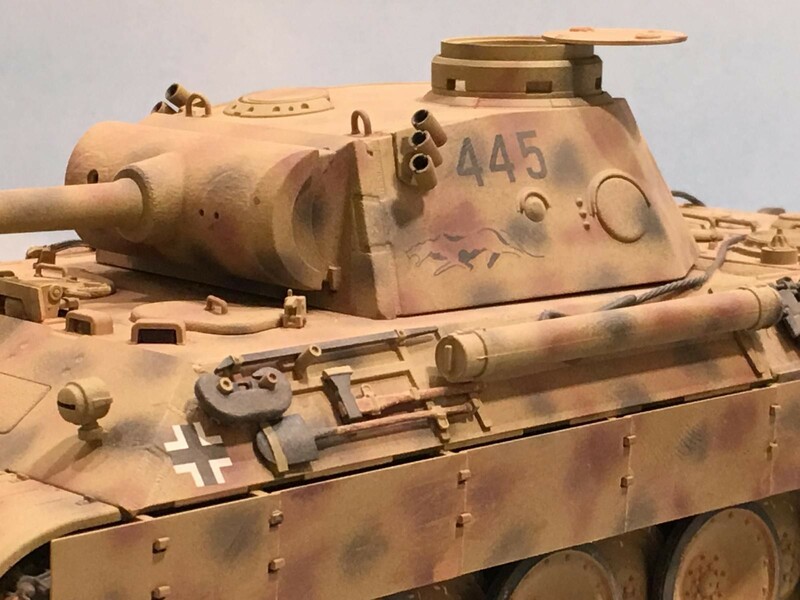 Excellent build of a great cat and of course good to see armor, Louis!